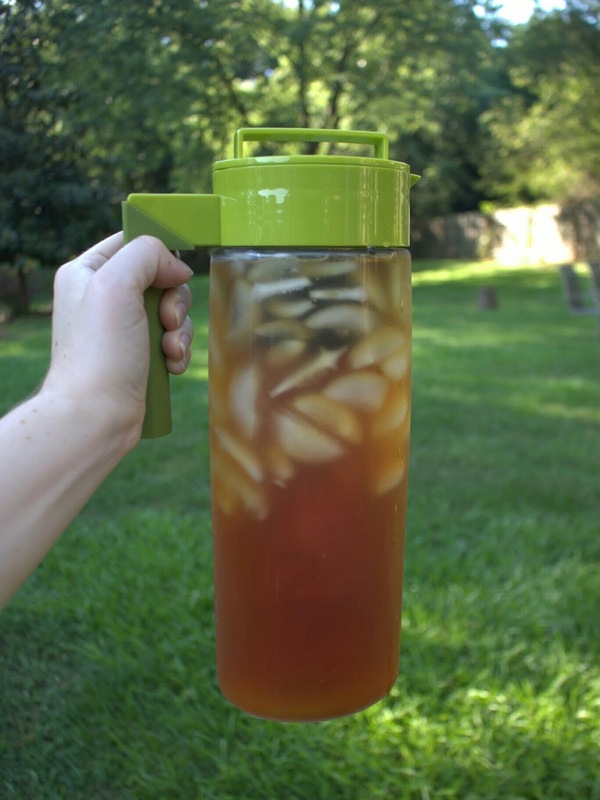 It is officially iced tea season down here in the South. Afternoon temperatures are reaching the high 80's on a daily basis and it will only get hotter in the next few weeks. I don't love the heat and have to keep myself from wishing the Summer away and pining for the coolness of Fall already. My son will be two this Fall and I don't want to wish away this sweet baby time with him. Plus, there are so many fun Summer things that I am excited about...fresh veggies and berries from the garden, Fourth of July, roadtrips...and iced tea. Lately, I've been cold brewing with this Cold Brew Tea Set from Zens Lifestyle. The glass and bamboo set allows tea to be brewed over a period of several hours as ice slowly melts, the cool water steeping the tea as it drips through the filter. When I used the set for the first time, I was worried that the brew method wouldn't fully extract the tea since the water doesn't rest on the leaves for very long before dripping through but this wasn't the case. The final brews of the teas that I used came out just as flavorful without any astringency and with a lighter mouthfeel. This method works best with green and white teas. 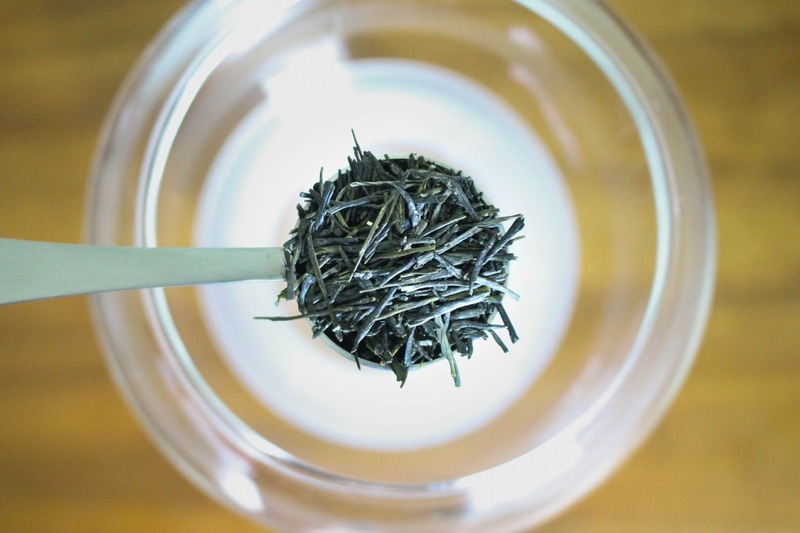 My favorite tea to use was a Japanese green tea which came through with all the expected floral and vegetal notes with a sweetness not present when hot brewed. After experimenting with it a few times, I found the ideal brew parameters to be 12 oz of ice over 2 tsp of tea. Total brew time averaged around six hours, making it necessary to plan ahead if I wanted the tea to be ready during the toasty afternoon, but this was easily done. The final cup is just enough to share with a friend or plenty to enjoy on your own. I've really enjoyed using this set with teas that I'm already familiar with to see what different flavor profiles are pulled out by the ice. 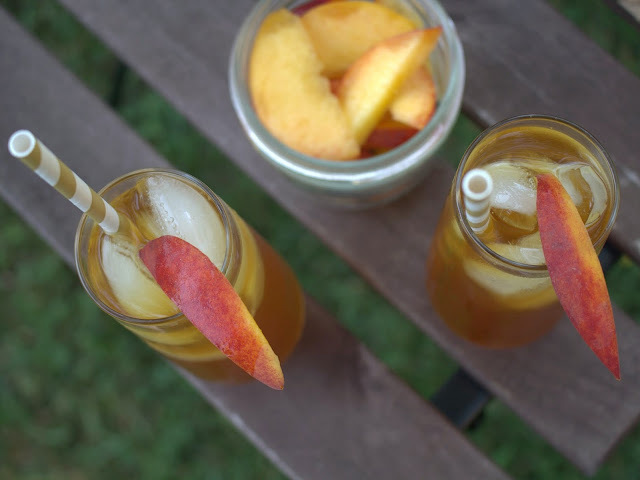 I'm excited to add this cold brew method to the iced tea rotation that will be going on all Summer long! I absolutely love the cherry tree in our yard. 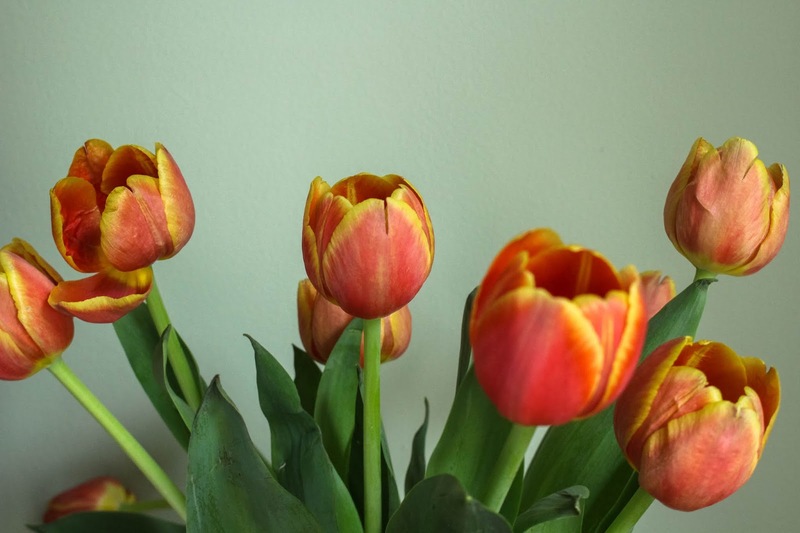 It turns the most vibrant shade of orange in the Fall and has the prettiest blooms in the Spring. The tree is getting old and a little scraggly (and the roots are trying to invade our plumbing) so it may not be here for many more years and I'm trying to soak up the beauty of it while it's still around. Spring feels like it has fully arrived once the tree is absolutely covered in soft pink blooms. The air is still cool and the pollen has yet to invade making it a sweet little segue into the new season. 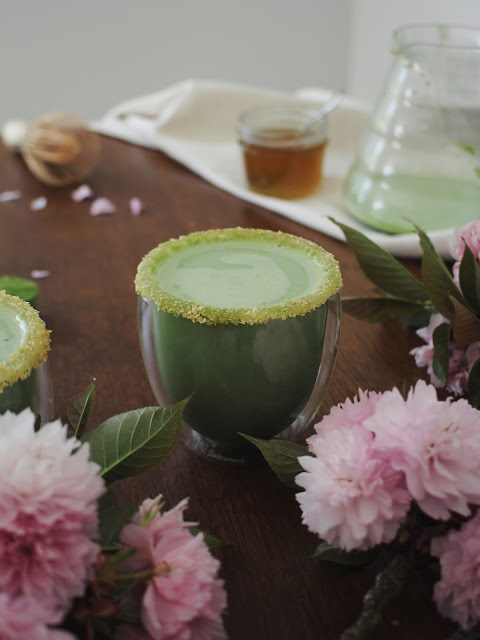 This Ginger Matcha Latte is perfect for the coming of Spring. 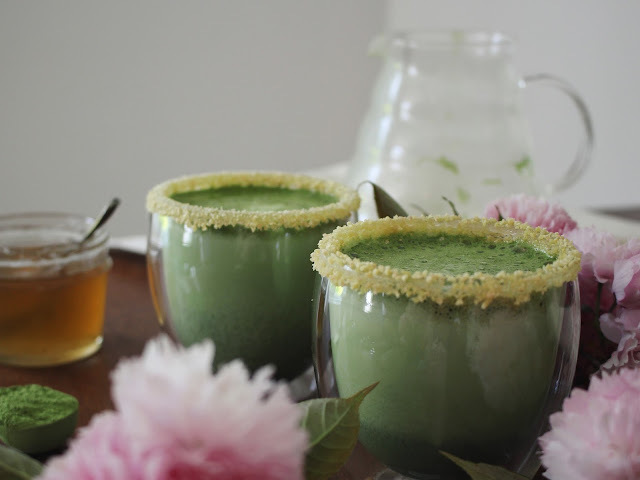 The fresh matcha mirrors the green that is popping out all around, the spicy ginger is warming during the slightly chilly mornings, and together the two make for an energizing combo. 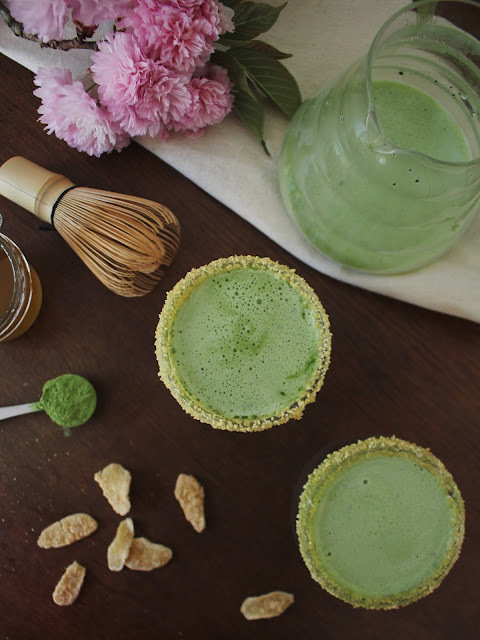 Matcha and ginger are both full of antioxidants and have anti-inflammatory properties making them a powerhouse duo for shaking off Winter and stepping into Spring on the right foot. Prepping the different recipe components takes a bit of pre-planning and time but makes enough for several servings. 1. Prepare batch of simple syrup. 2. Prepare candied ginger and allow to cool. Grind or finely chop and place in a shallow bowl or plate. 3. Brush the rim of each glass with a light layer of simple syrup. Turn the glass upside down and place the rim in the candied ginger, rotating gently to coat. 4. Sift matcha into separate mixing vessel. 5. Add 2 tbsp hot water and whisk or blend. 6. Add hot milk and whisk or blend. 7. 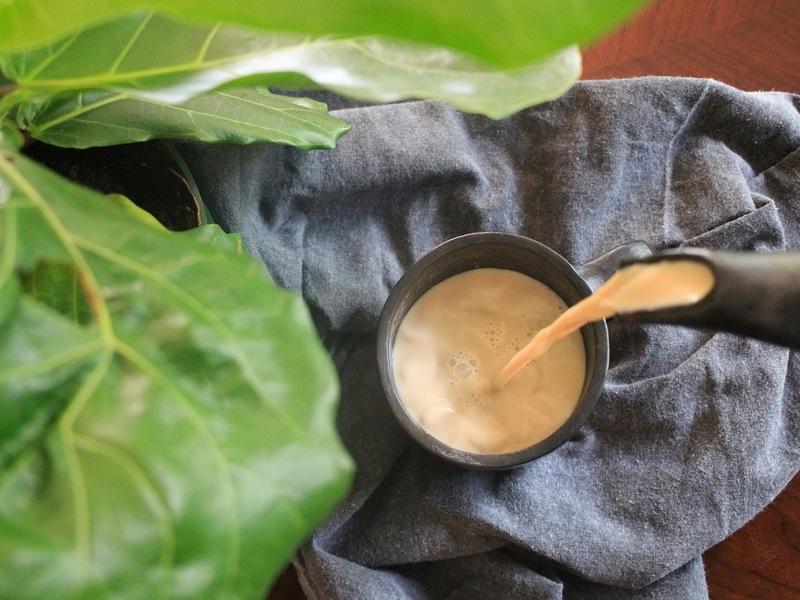 Add simple syrup to taste and whisk until frothy. 8. Pour into rimmed glasses and enjoy! The beginning of September has arrived and the tips of the leaves are slowly beginning to show signs of Fall color. 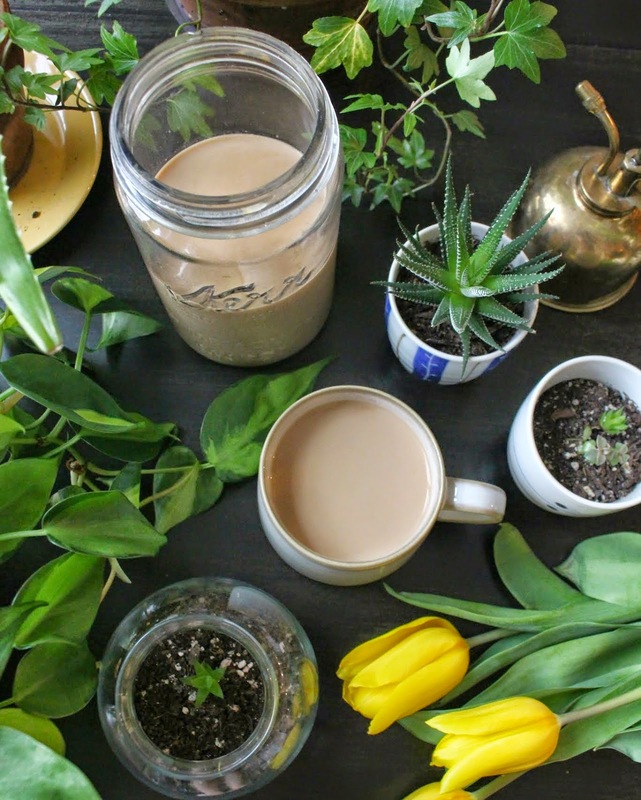 The morning temperatures are finally under 70 and I'm taking advantage of the cool air by making a pot of chai and sipping it with the windows open, looking forward to all of the changes this season is going to bring. 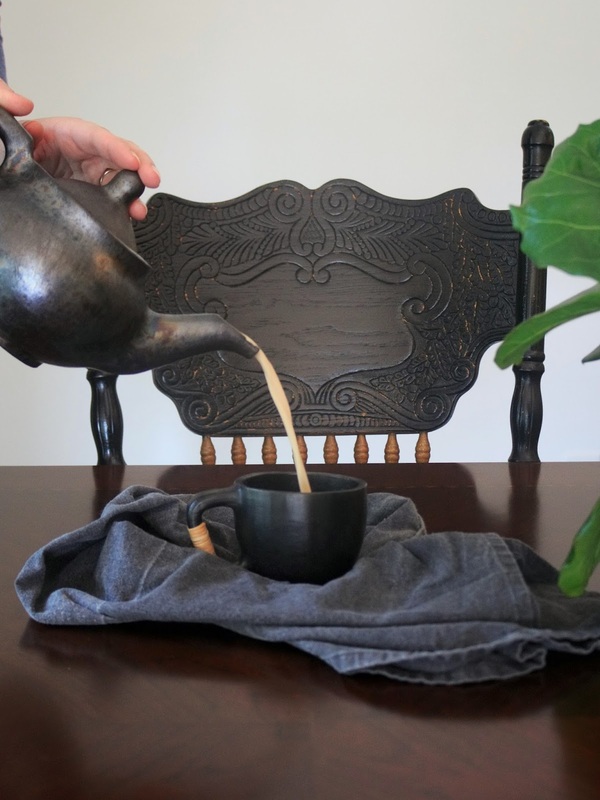 This black stone pottery tea set comes from Terra Klay, a company that sources handcrafted earthenware from a group of skilled artisans in North East India. Each pot is handmade from locally sourced materials by women whose tribes have used these traditional pottery techniques for generations. 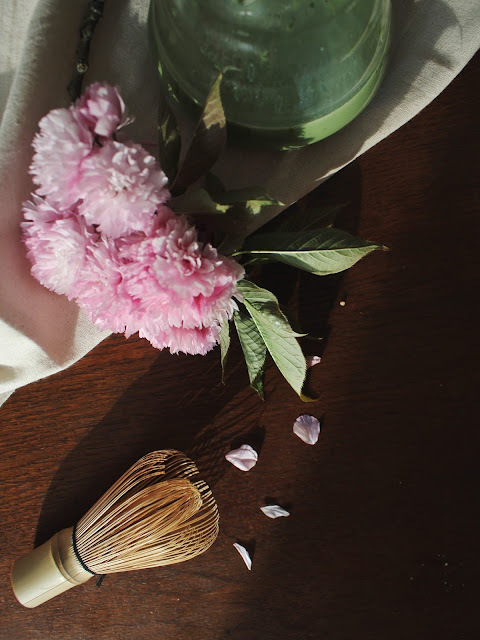 Because every piece is made by hand, using bamboo tools rather than a potter's wheel, each pot and cup are one of a kind. Each unique pot design is named after one of the artisans involved in the design and production of the pottery. What I appreciate most about these pieces is that the supply chain - from unfinished clay to fired product - focuses on fair trade methods, aiming to support the local community through sales of their traditional wares. This set is not only beautifully made - it also supports the woman makers and their community on a daily basis. Educating ourselves about the supply chains of the products we use and letting it impact our purchases has a ripple effect through to the workers and producers at the end of the line. Our purchase choices can help hold companies accountable for the business choices they make and the way they treat their workers. Supporting a company, like Terra Klay, that uses their influence to empower those involved in production adds incalculable value to an already artistic and unique product. Terra Klay is graciously offering free shipping through the end of November with the code TEATIME. Their black stone pottery is lead free, food safe, and "seasons" as it absorbs tea oils over time. Head over to their website to learn more about these one-of-a-kind sets that are not only pieces of art but also support a group of traditional artisans in a remote part of the world. Our first trip of the Summer is coming up! My love and I will be spending some time in the Northwest visiting friends and family, attending a wedding, and hopefully relaxing a bit along the way. I've started compiling a list of tea shops to stop off at throughout the week, if time allows, since Portland has no shortage of well-known and unique tea and coffee shops. Any shop recommendations from folks familiar with the city? With trip planning and a handful of life transitions going on, things have been quite busy around here for the past while. I've recently been sipping on Pique Tea, a crystallized tea that dissolves in hot (or cold) water. 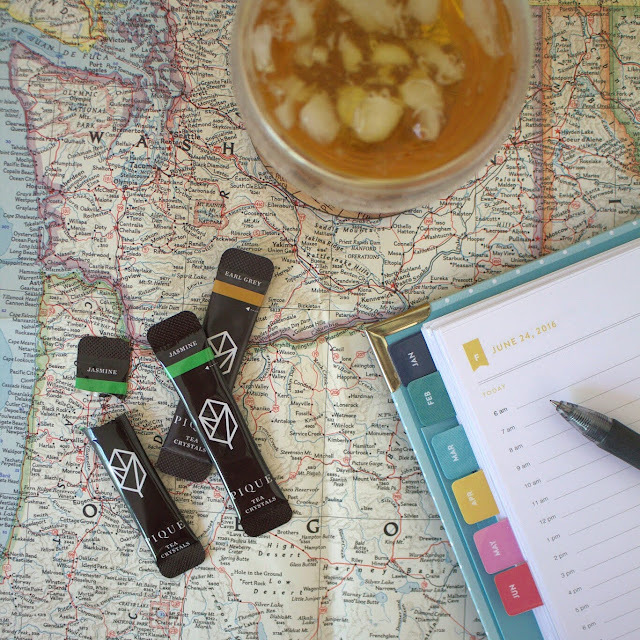 Each packet contains pure, organic, unsweetened tea crystals with a high level of antioxidants. 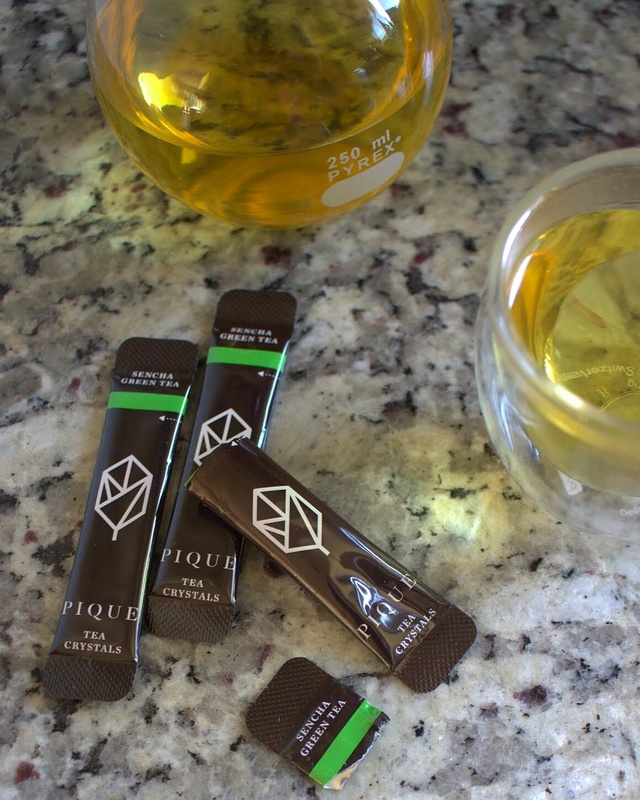 It leaves no residue on the bottom of the cup and tastes like a high-quality cup of brewed tea since only the best full leaf tea is used to prepare the crystals. 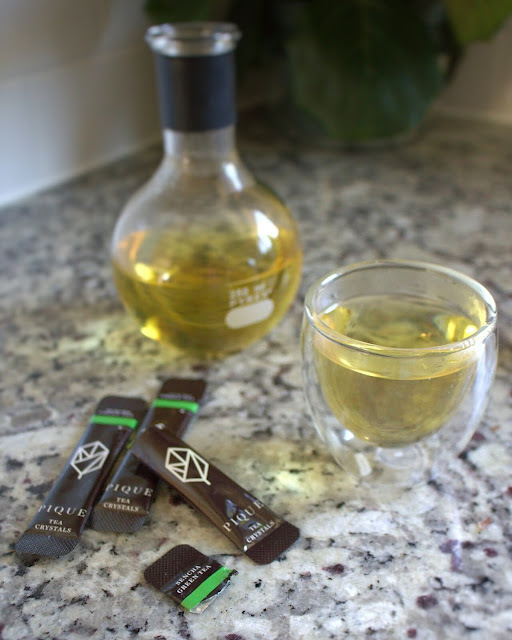 Basically, it's a simplified way to get an excellent cup of tea quickly at home or easily while on the go without sacrificing quality or taste. Guess what I'll be taking on the plane with me during our trip? 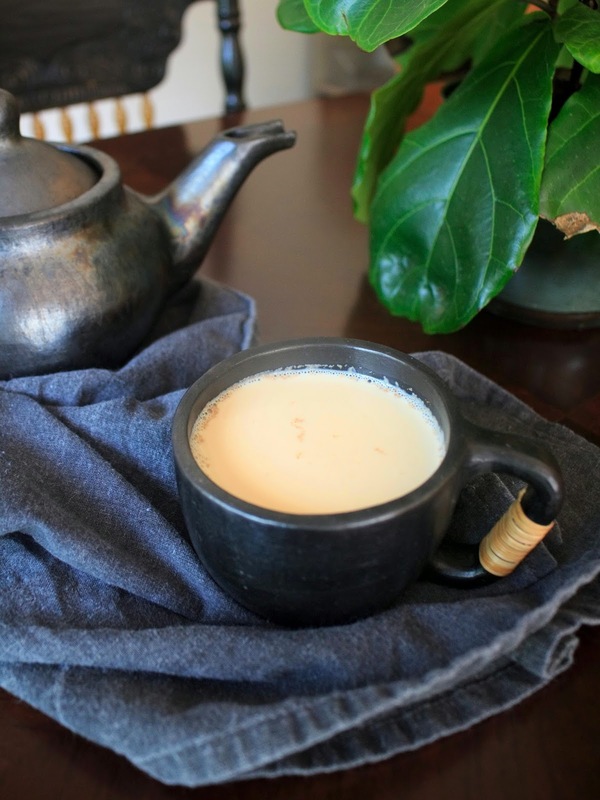 Want to try Pique Tea out? They've generously offered a 15% discount for any new orders placed through the end of the month. Just use the code TEACRYSTALS15 for 15% off your order at checkout. I recommend trying the variety pack but my favorites so far are the Sencha and Earl Grey. Check out all of the different options on the Pique website! 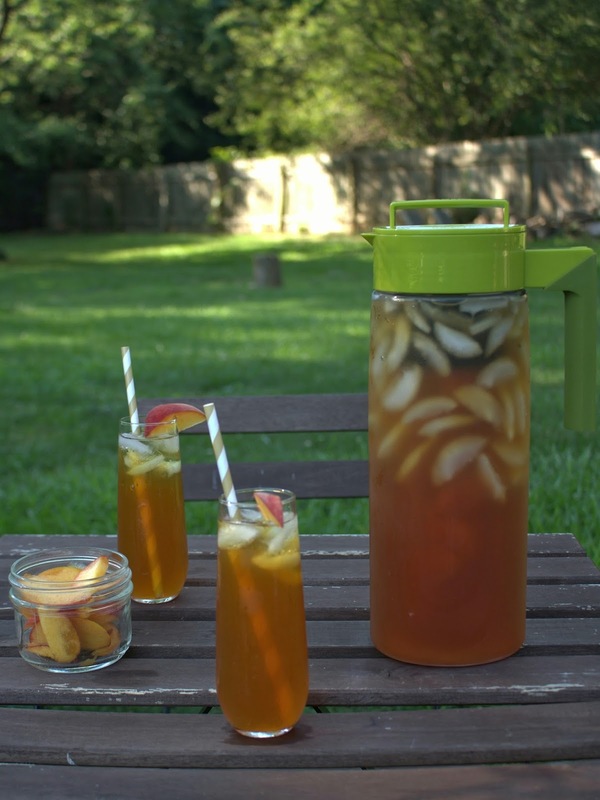 Happy National Iced Tea Day! 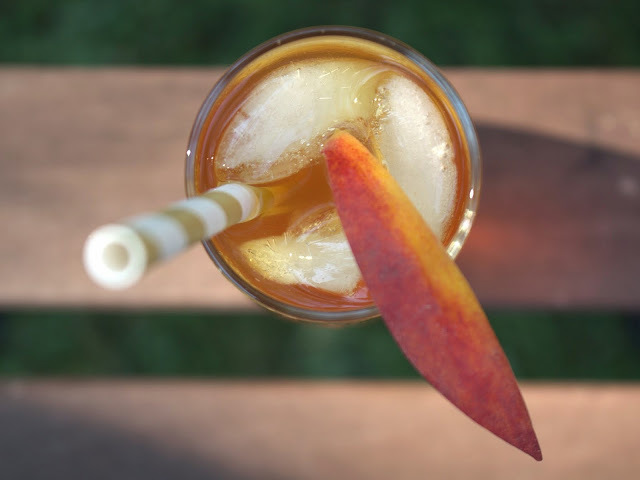 Knowing today was going to be a hot one, I prepped a pitcher of Tropical Black Tea from Takeya and added some fresh peaches for a refreshing afternoon treat. Summer weather has officially arrived in Atlanta, with temperatures over 90 and high humidity on a regular basis. Keeping hydrated has been a challenge! 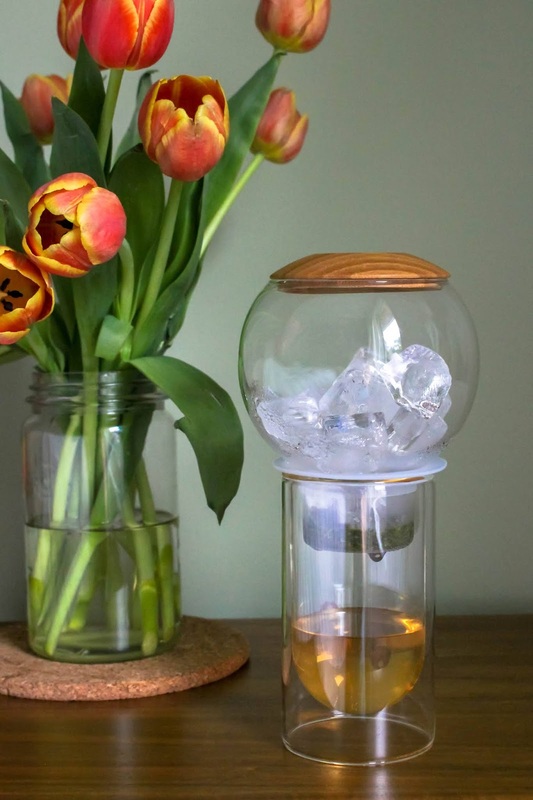 I'm excited to play around with Takeya's Deluxe Iced Tea Beverage System to make iced tea and infused water all Summer long. To celebrate National Iced Tea Month and the beginning of Summer, I've partnered up with Takeya to give away a Deluxe Iced Tea Beverage System and a pack of their Hibiscus Pomegranate Tea! I love that this pitcher is a whole 64 oz, seals tightly enough to store on its side, and is BPA free. It's perfect for the onslaught of hot weather, sunny days, and Summer parties on the way. Check out the giveway below! A winner will be chosen at random on Wednesday, June 15th. Rolling into a long, three day weekend, I was looking for something cool and mildly sweet to sip on as I relaxed and prepped an easy dinner. Milk tea is just that! 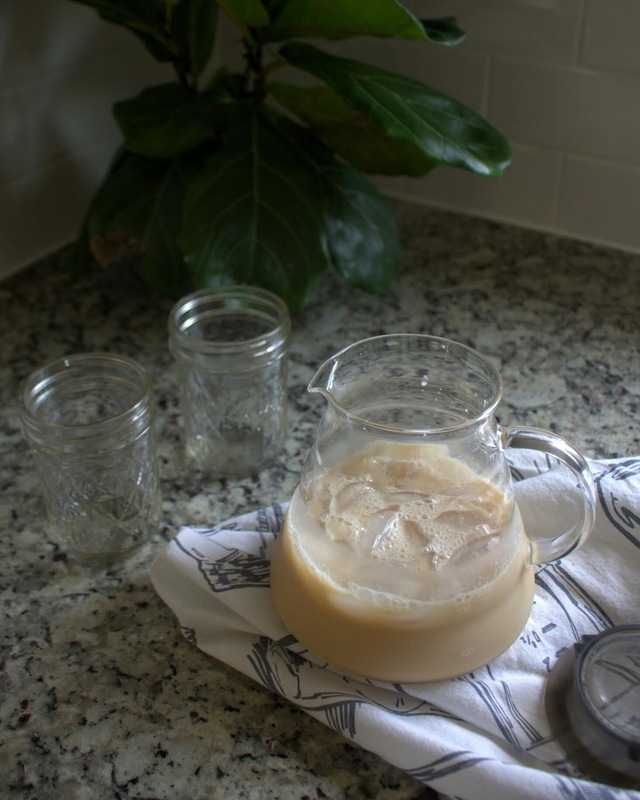 Total prep time is about ten minutes and the result is a creamy, sweet iced tea outside of my usual chai or unsweetened tea. Sugar can be substituted for the honey if preferred but I love the smell and taste of the honey with this recipe. Bonus if it's local honey and double bonus if you can get your hands on local milk! Today I had neither 😉 but I intend to make this recipe again soon with both. The taste is noticeably improved by local, less processed ingredients and, thankfully, these are easily accessable at my local farmers market and general grocery store. 1. Bring water to a boil and pour over tea, steeping for five minutes. 2. 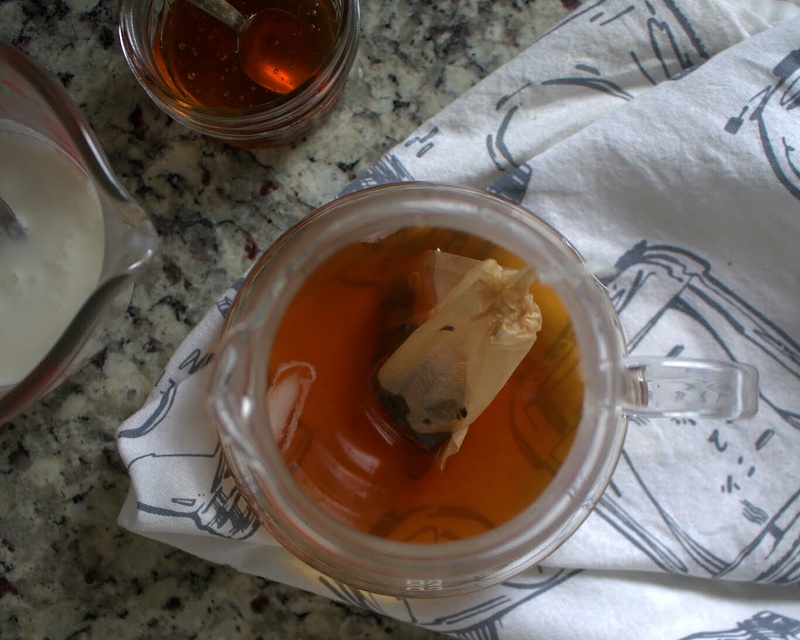 After the five minutes are up, remove tea and add honey to taste. 3. Pour sweetened tea over ice and stir. 4. Add milk, stir, and enjoy! I generally store the chai in a jar in the fridge for no more than five days. 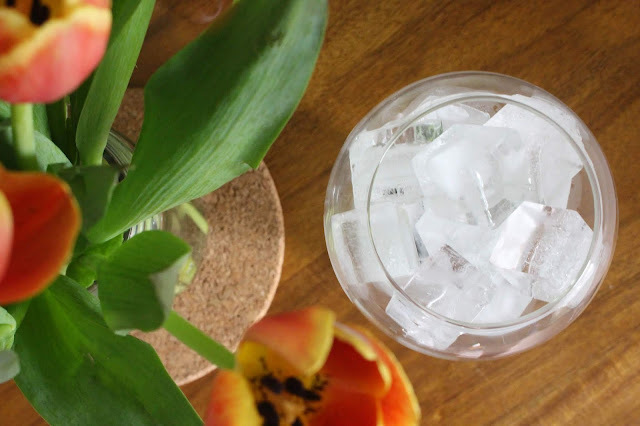 This recipe is also excellent over ice. Enjoy, friends!